and a protector of the world (Lokapala) His many epithets extol him as the overlord of numerous semi-divine species and the owner of the treasures of the world. Kubera is often depicted as a fat man, adorned with jewels and carrying a money-pot or money-bag, and a club. "glory" and "splendours" of Kubera's city are found in many scriptures. Kubera has also been assimilated into the Buddhist and Jain pantheons. In Buddhism, he is known as Vaisravana, the patronymic used of the Hindu Kubera and is also equated with Pañcika, while in Jainism, he is known as Sarvanubhuti. Kubera is often depicted as a dwarf, with fair complexion and a big belly. He is described as having three legs, only eight teeth, one eye, and being adorned with jewels. texts. Kubera holds a mace, a pomegranate or a money bag in his hand. He may also carry a sheaf of jewels or a mongoose with him. In Tibet, the mongoose is considered a symbol of Kubera's victory over Nāgas—the guardians of treasures. Kubera is usually depicted with a mongoose in Buddhist iconography. A bronze Matrika goddess group along with Ganesha (left) and Kubera (right) currently at the British Museum. Originally from Eastern India, it was dedicated in 43rd year of reign of Mahipala I (c. 1043 AD). emerging from a lotus and a conch respectively. with multi-coloured attributes. In some sources, especially in Jain depictions, Kubera is depicted as a drunkard, signified by the "nectar vessel" in his hand. Jambhala, the Buddhist Kubera, depicted similar to Kubera The exact origins of the name Kubera are unknown. "Kubera" or "Kuvera" (कुवेर) as spelt in later Sanskrit, means "deformed or monstrous" or "ill-shaped one"; indicating his deformities. Another theory suggests that Kubera may be derived from the verb root kumba, meaning to conceal. Kuvera is also split as ku (earth), and vira (hero). commentary says that Vaisravana is derived from a name of Kubera's kingdom, Visana. Once, Kubera looked at Shiva and his wife Parvati with jealousy, so he lost one of his eyes. Parvati also turned this deformed eye yellow. So, Kubera gained the name Ekaksipingala ("one who has one yellow eye"). He is also called Bhutesha ("Lord of spirits") like Shiva. Kubera usually is drawn by spirits or men (nara), so is called Nara-vahana, one whose vahana (mount) is nara. Hopkins interprets naras as being water-spirits, although Mani translates nara as men. Kubera also rides the elephant called Sarvabhauma as a loka-pala. Atharvaveda calls him the "god of hiding". In the Atharvaveda—where he first appears-and the Shatapatha Brahmana, Kubera is the chief of evil spirits or spirits of darkness, and son of Vaishravana. The Shatapatha Brahmana calls him the Lord of thieves and criminals. In the Manusmriti, he becomes a respectable Loka-pala ("world protector") and the patron of merchants. In the epic Mahabharata, Kubera is described as the son of Prajapati Pulastya and his wife Idavida and the brother of sage Vishrava. Kubera is described as born from a cow. However, from the Puranas, he is described as the grandson of Pulastya and the son of Vishrava and his wife Ilavida (or Ilivila or Devavarnini), daughter of the sage Bharadvaja or Trinabindu. By this time, though still described as an asura (demon), Kubera is offered prayers at the end of all ritual sacrifices.His titles, such as "best of kings" and "Lord of kings" (Harivamsa indicate that Kubera is made "Lord of kings"), in contrast to the god-king of heaven, Indra, whose title of "best of gods" led to the later belief that Kubera was a man. The early texts Gautama Dharmashastra and Apastamba describe him as a man. Only the Grihyasutras of Shankhayana and Hiranyakesin call him a god, and suggest offerings of meat, sesame seeds and flowers to him. Brahma with the four Loka-palas. Kubera, the Lord of the North and wealth, carrying a mace and with a lion, is second from right The Puranas and the epics Mahabharata and Ramayana grant Kubera unquestioned godhood. 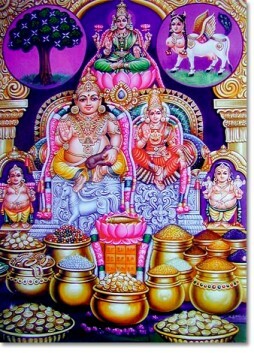 Kubera also acquired the status of the "Lord of riches" and the wealthiest Deva. He also becomes a Loka-pala ("world protector") and guardian (dik-pala) of the North direction, although he is also sometimes associated with the East. Brahma conferred upon Kubera the lordship of wealth, friendship with Shiva, godhood, status as a world-protector, a son called Nalakubera/Nalakubara, the Pushpaka Vimana and the lordship of the Nairrata demons. the brother of Kubera, so Kubera is described as the uncle of Ravana and his siblings. It records that when Kubera approached Brahma for the favour of superseding his father Pulastya, Pulastya created Vishrava. To seek the favour of Vishrava, Kubera sent three women to him, by whom Vishrava begot his demon children. Ravana, after acquiring a boon of Brahma, drove Kubera away from Lanka and seized his Pushpaka Vimana, which was returned to Kubera after Ravana's death. Kubera then settled on Gandhamandana mountain, near Mount Kailash — the cosmological abode of the god Shiva-in the Himalayas. Sometimes, Kailash itself is called Kubera's residence. His city is usually called Alaka or Alaka-puri ("curl-city"), but also Prabha ("splendour"), Vasudhara ("bejeweled") and Vasu-sthali ("abode of treasures"). There, Kubera had a grove called Caitraratha, where the leaves were jewels and the fruits were girls of heaven. There is also a charming lake called Nalini in the grove. Kubera is often described as a friend of Shiva in the epics. The Padma Purana says that Kubera prayed to Shiva for many years, and Shiva granted him the kingship of Yakshas. residence. Alaka is recorded to be plundered by Ravana once, and attacked by the Pandava prince, Bhima once. Kubera's Nairrata army is described to have defeated king Mucukunda, who then defeated them by the advice of his guru Vashishta. Shukra, the preceptor of the demons, is also recorded to have defeated Kubera and stolen his wealth. Another major tale in the scriptures records how Kubera entertained the sage Ashtavakra in his palace. marriage-divinity. He is invoked with Shiva at weddings and is described as Kameshvara ("Lord of Kama – pleasure, desire etc."). He is associated with fertility of the aquatic type. – a female Yaksha and Charvi ("splendour"). They had three sons: Nalakubara ("Reed-axle"), Manigriva ("Bejewled-neck") or Varna-kavi ("Colourful poet"), and Mayuraja ("king of animals resembling men"); and a daughter called Minakshi ("fish-eyed"). The Mahabharata calls his wife Riddhi ("prosperity") and Nalakubara his son. The goddess of wealth Lakshmi is sometimes described as his consort. pay it back to Kubera. Kubera is worshipped with Lakshmi, the goddess of wealth during Diwali, which is primarily dedicated to her – usually on the Dhanteras day.